NOW The ULTIMATE SAPPHIRE HD 6670! Special bundle - Codemasters Dirt3 included! Building on its reputation for special editions and silent cooled graphics cards, SAPPHIRE Technology has just introduced the ULTIMATE Edition of the SAPPHIRE HD 6670, boasting the full performance and features of the fan cooled models, but with a totally silent heatpipe cooler. Helping to demonstrate its best-in-class performance the HD 6670 ULTIMATE bundle will include an access code for the latest hot driving game, Codemasters Dirt3! 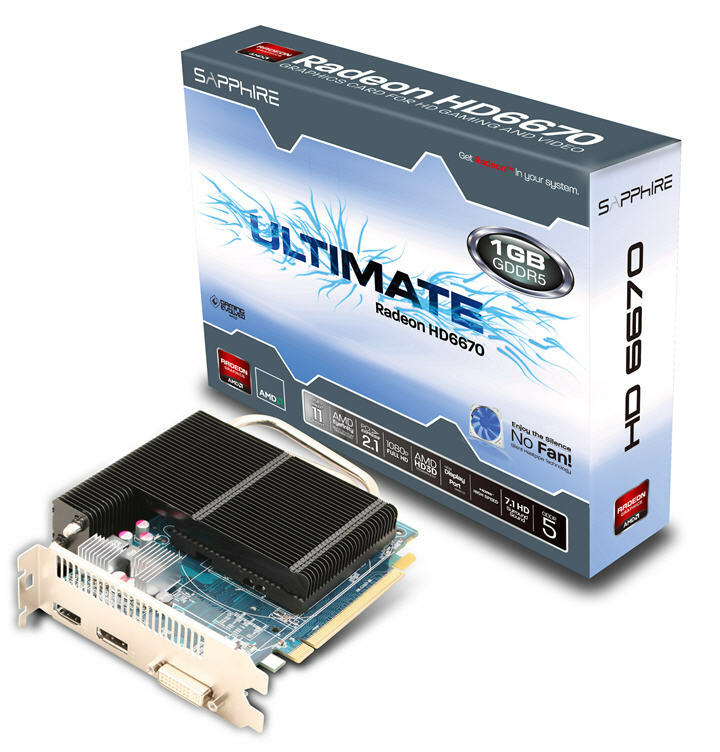 The SAPPHIRE HD 6670 ULTIMATE has 480 Stream Processors and sports 1GB of the latest DDR5 memory. With clock speeds of 800MHz core and 1000MHz (4GHz effective) for the memory, it delivers the same performance as fan cooled models, but with a totally silent heatpipe cooler, making it one of the fastest and most capable silent-cooled graphics card available today. The output configuration on the bracket is Dual-Link DVI, HDMI and DisplayPort and a DVI to VGA adapter is included. The SAPPHIRE HD 6670 ULTIMATE will support three monitors in Eyefinity mode with a suitable DisplayPort monitor or active display adapter. In addition, native CrossFire support allows two or more cards to be used together for additional performance on a suitable CrossFireX compatible mainboard. The SAPPHIRE HD 6670 ULTIMATE Edition delivers new gaming experiences and acceleration of next generation high performance applications yet runs totally silently. All of this comes with low active power consumption and Dynamic Power Management delivering super low-power operation in 2D or idle. As the core technology is low power, no external power connection is required, making this series ideal for system upgrades or mainstream PCs that do not have high end power supplies. At the same time SAPPHIRE will introduce the HD 6570 ULTIMATE, a single slot low profile card with silent heatpipe cooler. With its 480 stream processors, engine clocks of 650MHz and 1GB of DDR3 memory clocked at 900MHz (1.8GHz effective) this is an ideal solution for HTPCs or general purpose PCs where silent operation is an advantage. Outputs are HDMI, DVI-D and VGA. All products in the SAPPHIRE HD 6000 series deliver on-board hardware video decoding with the AMD UVD (universal Video Decoder) - now in its third generation and including support for MVC and decoding Blu-Ray 3D for stereoscopic 3D over HDMI 1.4a. 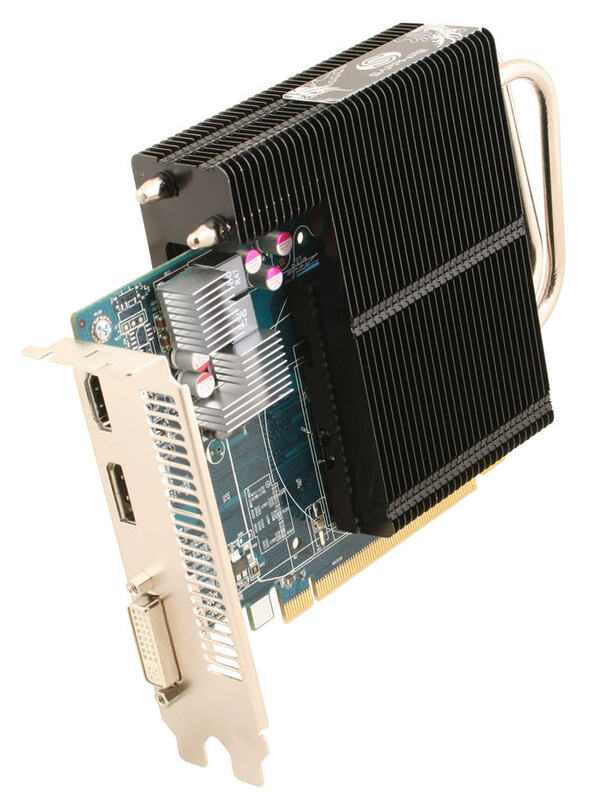 The SAPPHIRE HD 6000 series is fully DirectX 11 and Windows 7 compatible and also supports AMD’s APP Acceleration for applications such as video transcoding and rendering tasks by executing instructions on the GPU architecture rather than the system CPU. The series is supported by AMD’s Catalyst DirectX 11 WHQL certified graphics driver which enables all of the key DirectX 11 level features including DirectCompute 11 instructions, hardware Tessellation and multi-threaded communications with the system CPU.